Thu, Apr 25, 2019, 20:27:44 ---- The fact: 42.844.000 visitors done. Scarborough, UK, August 17, 2009 --- Unison has launched an all-electric tube bending machine that has the power to bend tubing with outside diameters up to 170 mm (6.7 inches). The new Breeze 170 can generate a bending torque as high as 135,000 Nm - which is nearly 50% more than the company's previous most powerful 150 mm machine. It brings the enormous process flexibility and business advantages of software-controlled set-up and bending to a new class of heavy-duty applications. The Breeze 170 is likely to open up entirely new application areas in aerospace and shipbuilding. The machine's ability to accommodate such large diameter tubing, combined with its power and precision bending capabilities, make it particularly suitable for handling lightweight high-strength ducting manufactured from specialist materials such as commercially pure (CP) titanium, titanium alloys and stainless steel. Fast, software-controlled setup enables the Breeze 170 to handle batch sizes as small as one in a very efficient manner. The Breeze 170 offers highly accurate, fully programmable control of the rotary draw bending process. 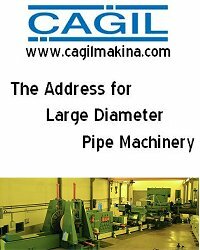 The machine can accommodate tubing with a wall thickness of up to 3 mm and can produce bends of up to 180 degrees, with a bending speed of up to 10 degrees/second. It can also perform bending operations extremely slowly, which is a critical attribute for the precision forming of titanium. The Breeze 170 is designed specifically for absolute rigidity, and uses fast-acting closed-loop servo control to ensure very high process accuracy - the machine provides a repeatability of 0.1 degree on both the bend angle and the bend plane. Bending accuracy is further supported by a unique wiper die system, which features precision set-up facilities. The Unibend machine control software supplied with the Breeze 170 runs under Windows XP or Vista on any industry-standard PC. This software has evolved steadily ever since Unison produced the world's first all-electric tube bending machine in 1994, and is now widely acknowledged to be one of the most versatile tube-bending packages on the market. Unlike traditional hydraulically-powered tube benders, Unison's all-electric machines provide users with complete control over the bend operation; they can modify the bend speed, clamping pressure, pressure die position and force, and mandrel positioning parameters, to achieve the optimum bend. Advanced features include fully automated tube sensing and clamping, which reduce setup times significantly. The software also includes powerful remote diagnostic aids, which enable Unison's engineering team to quickly resolve any bending problems or machine performance issues at customers' sites. A software 'black box' - which automatically stores the last 500 instructions entered by the operator, together with details of machinery positions from the servo motor sensors - allows Unison to help users optimise their processes, and to provide remote maintenance services. Tube bending operations can be programmed in three ways. Programs can be generated automatically, by transferring data from CAD software files -Unison has interfaces for all popular CAD packages, and will develop interfaces for any others that are required, including a manufacturer's proprietary design software. A simple programming template is also available, enabling users to create a program by entering the distance between bends, the angle of bend required, and rotation of the tube. A further option is copying or reverse engineering, by using a tube measuring system to recreate the coordinates directly from a sample or prototype. In place of hydraulic force, the Breeze 170 employs servo motors to control the entire tube bending process, including clamp, pressure die, mandrel and follower. This all-electric actuation provides significant performance benefits in terms of energy consumption, repeatability, and noise reduction. The actuation elements of the machine only draw appreciable current when a bend is being made, reducing energy consumption significantly; at all other times, the Breeze 170 consumes less than 1.5 kW/hour. Noise is also measurably reduced - the Breeze 170 only generates around 50-60 dB, which is equivalent to normal voice level.